This year, in addition to celebrating World Puppetry Day with our “Puppets Around the World” series, we are thrilled to be participating in an international artist residency cultural exchange program in partnership with the Casteliers Festival and the Montreal Arts Council. On March 1st, we said “Adieu!” to Boston-based puppeteer Veronica Barron as she travelled north to begin her international adventure in Montreal. On March 22nd, we will welcome international guest artist Caroline Bernier-Dionne to Brookline and Boston for a month of creative research at Puppet Showplace Theater. Learn more below about these fantastic globe-trotting performers, and stay tuned for ways you can meet them in person and experience their work! Since 2007, puppeteer Caroline Bernier-Dionne has integrated puppetry into her multidisciplinary artistic practice. Her many talents include multiple styles of puppet manipulation, interpretive movement, stilt-walking, and figure skating. Caroline graduated with a degree in theater from Cégep de Saint-Hyacinthe. She has worked with the Théâtre de la Dame de Cœur and the Théâtre de l'Avant-Pays, as well as in film and television. Recently, she participated in a musical at the Olympia which allowed her to perform with a puppet as a companion to operatic singing. During her residency in New England, Caroline will explore puppetry in the service of musical expression, practicing lip synch while perfecting her technique of manipulating puppets to music. She will also investigate the intersections between live performance and cinematographic capture. While here, Caroline will share her work with the local puppetry community and will forge connections with the many outstanding professional puppeteers who perform at Puppet Showplace. 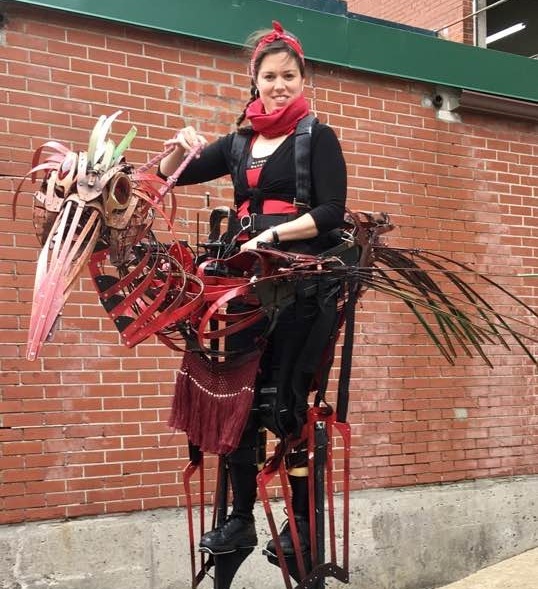 Boston-based puppeteer Veronica Barron is also spending a month in Montreal, experiencing the city’s vibrant local puppetry scene as well as the amazing Casteliers International Puppetry Festival. She is the first-ever artist to complete a residency in the city’s new puppetry center: MIAM - La Maison Internationale des Arts de la Marionnette. Veronica’s work combines theater, dance, puppetry, clowning, and song. In her creations, she is interested in how stories emerge from everyday objects, body puppetry, and notions of gender and vulnerability. In October 2018, Veronica Barron presented at the Micro-Festival of Unfinished Puppetry in Trois-Rivières where she discovered the creative freedom of the puppet arts community in Quebec. 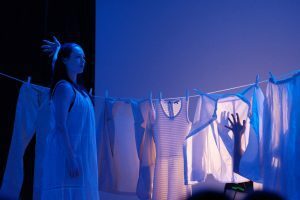 During this residency, she hopes to further explore women's body diversity through dance, shadows, and the use of clothing as puppets. Veronica Barron with Quebec-based puppeteers in an exploratory rehearsal at MIAM in Montreal. THANK YOU to the Casteliers Festival, the Montreal Arts Council, and all of Puppet Showplace Theater’s generous supporters for making this cross-cultural creative residency possible! Older PostPuppets Around the World!